With Spring just around the corner, I thought I'd share a touch of spring with you. I started out with my Tangerine Tango Ink and the Fossil Stone Technique, but thought I'd add a twist and spritzed some Lemon Glimmer Mist onto my clear envelope before I smooshed my Tangerine Ink into my card stock, giving my panel a nice shimmery look. I stamped the flower image in Black, then colored with Markers and Spica Glitter Pens. 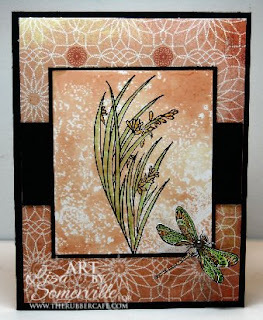 The dragonfly was stamped on Marco's Clay Coated card stock, then colored with Spica Pens. I added a Kaiser Black Pearl to the body of the dragonfly. It's going to reach the mid 70's here today, a record setting day - hope it's a nice springlike day for you too! ETA - I've had a few people email me about the coated card stock - you can find it here - it's MATTE Coated Cover Utopia from Appleton Papers 80# White, 50 sheets/package. Be sure to check out their blog for their special shipping offer. Gorgeous! I love the colors and the layout. Who makes Tangerine Tango ink, Lisa? It's a beautiful color that I think I need to add to my collection! lol Also...you are expecting 70's??? How about waking up to freezing temps and snowflakes here this morning? lol Spring is really having trouble in this part of the country. I love this Lisa. It really gourgeous! Wonderful colors! this is gorgeous...I really like those stamps! great layout!